“I see you,” I said. And he saw me. I felt him look into my eyes. Not scared, not worried, not concerned, just curious. The same way I felt. The words “I see you” echoed back. Then… he simply looked away and went back to eating grass. How often do these simple but profound things happen in life? Not so often that a person doesn’t remember each and every one of them. 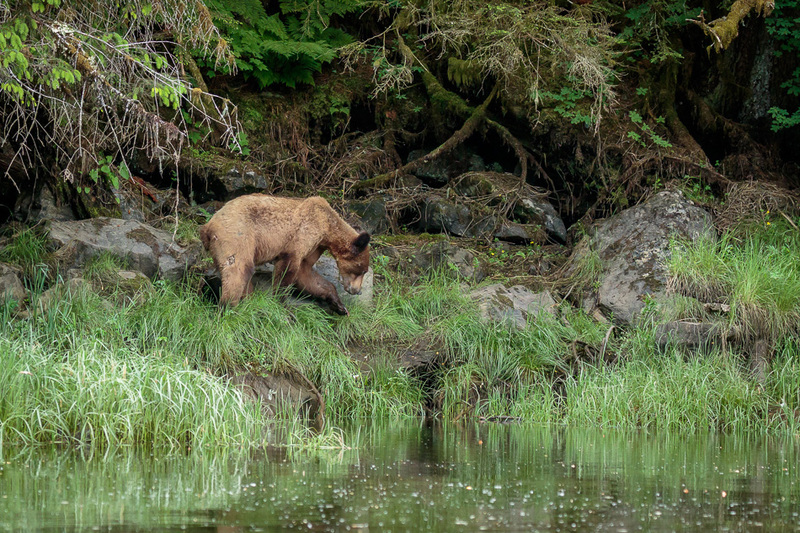 It was this profound experience I wanted and I got it within 20 minutes of stepping foot on the small zodiac that would take me into grizzly bear territory. The experience is more important to me than the photos. It’s also necessary, in my opinion, to have this kind of experience before you can convey emotion in an image. So I decided on the way in that I would resist the urge to hold up my camera and photograph the first bear I saw. I waited. I talked to the bear. I sat in the silent space and watched. And learned. 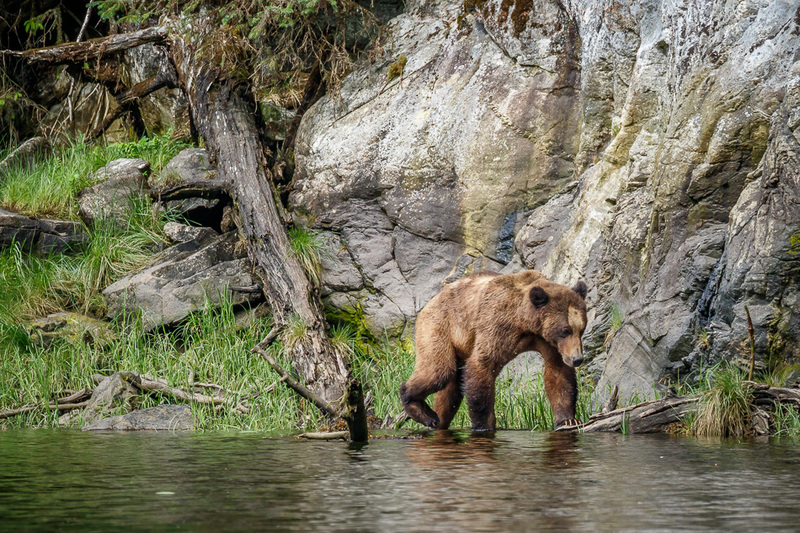 My first grizzly bear was in Khutzeymateen Provincial Park in northern British Columbia. 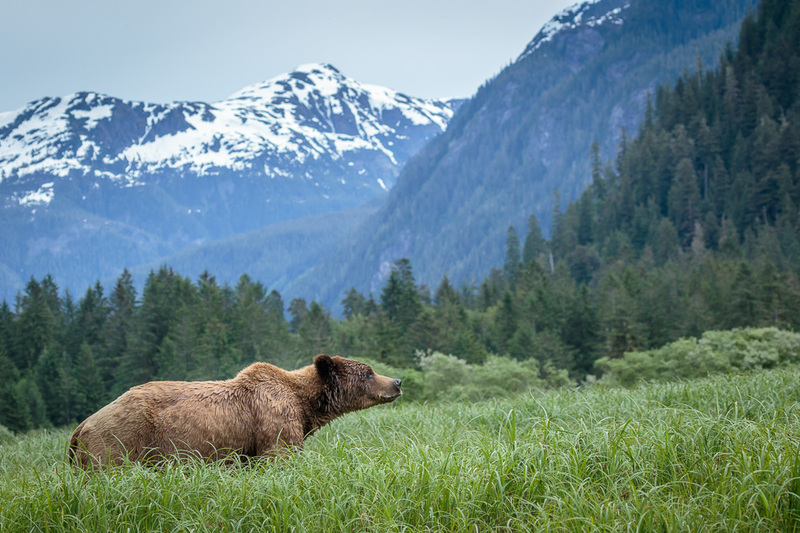 This grizzly bear sanctuary was the first area in Canada to be protected specifically for grizzly bears and their habitat. It includes over 45,000 hectares of rugged peaks, a valley of wetlands, old growth temperate rainforest and a large river estuary. The bears are different here. 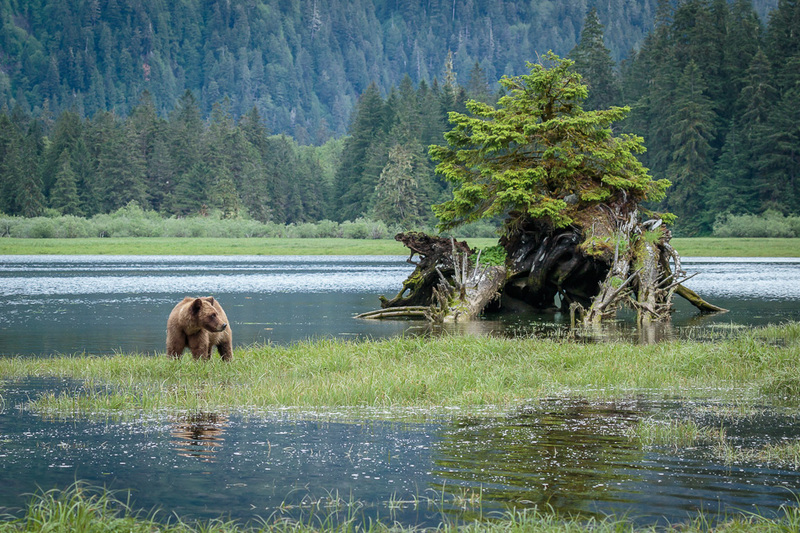 No bear has been hunted here for 23 years. 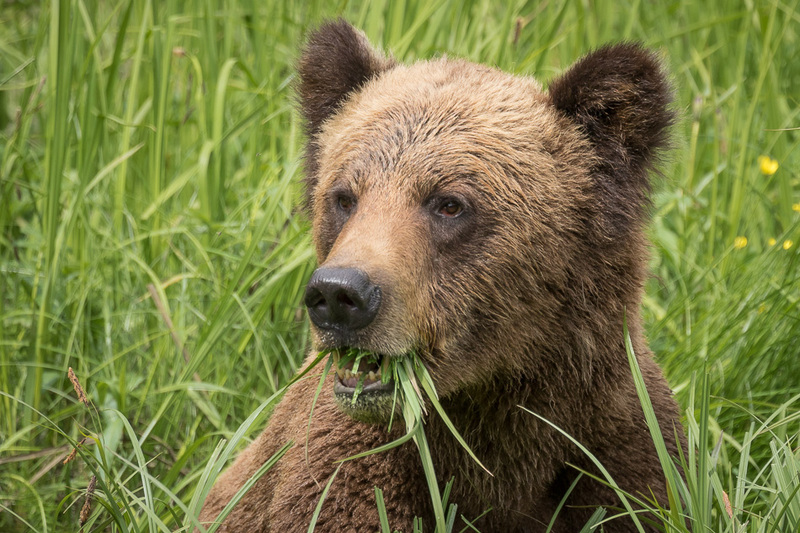 No bear has been collared or tranquillized and no bear has found food that belonged to a human. No human has gone ashore. 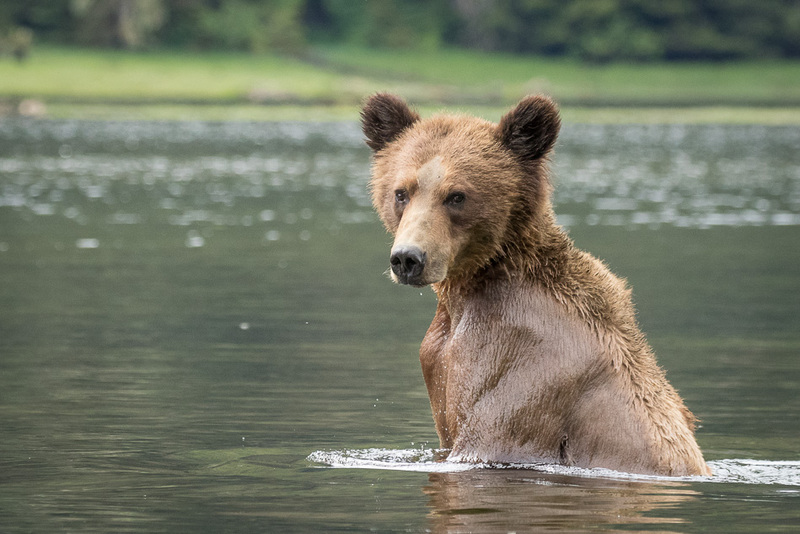 For these reasons, the grizzlies here do not see humans as a threat. Land access is prohibited, as is unguided access to the estuary. 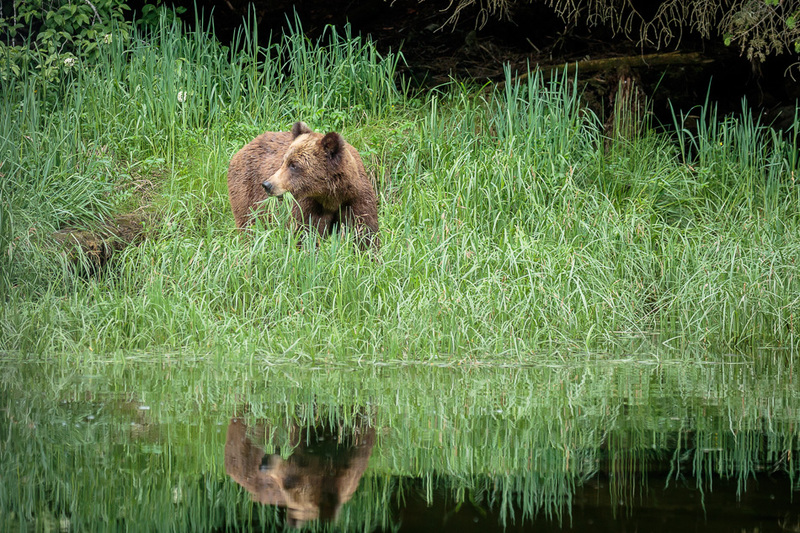 There are only a small handful of outfitters that are licensed to enter the estuary, which means that fewer than 200 people per year have the privilege of being here and witnessing the secret life of grizzly bears. This year I was one of them. I arrived by float plane from Prince Rupert and a zodiac transferred me to the majestic 70 foot ketch-rigged sailboat called the “Ocean Light II” that would be my home for the next 6 days. 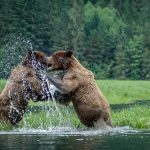 The trips are usually just 3 days long, but I decided to do two back-to-back trips to maximize my bear viewing opportunities. And I’m really glad I did! 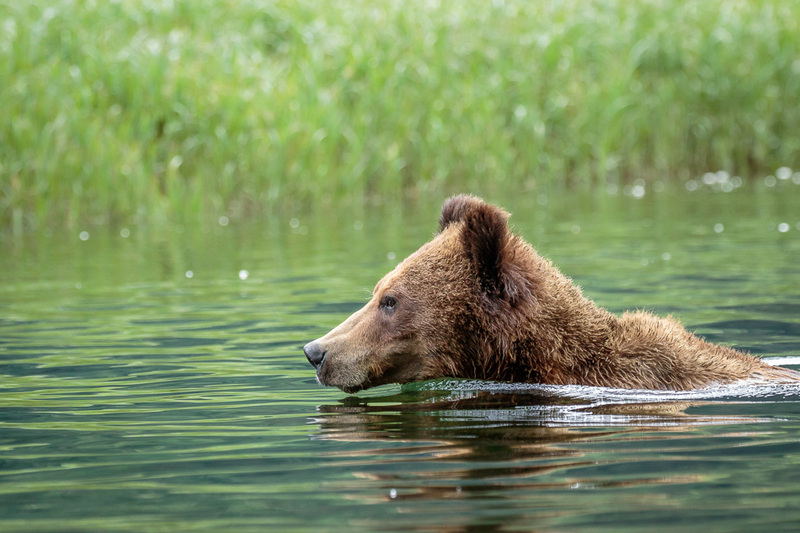 After getting settled, my fellow guests and I got back on board the zodiac and our bear guide took us up into the estuary for a life changing experience. One that would be repeated a number of times each day during my stay; each outing bringing a different experience and different photo opportunities. Back on board the mothership at dinner time, we enjoyed feasts of halibut and crab followed by decadent deserts. After bear-viewing time had passed, the guests would all sit in the dining area and exchange stories, look at photos, and even sing songs. And for people like me who appreciate their alone time, there’s lots of space on deck to sit in silence and marvel at the scenery (being summer-time in BC, it doesn’t get dark until about 9:30 PM). I bought a new camera for this trip! My old Canon 7D has been well used and loved during it’s life, but it was time for an upgrade, so I bought the Canon 7D Mark II. It has a much improved auto-focus system with many more features that are useful for wildlife photographers. I’m planning a whole post on how to set up your camera for wildlife photography soon, so be on the look-out for that. While I had a new camera, I had a lens conundrum. My 70-300mm lens was proving to be utterly hooped. I don’t know what happened to it, but it suddenly became pretty unreliable and it wasn’t worth fixing. There was also the issue of weight because there is a severe weight restriction on the float planes. I decided that the best option was to go with a 2 lens 2 camera body system so I wouldn’t have to worry about switching lenses in the field. I took my 24-105L and I rented a 100-400L. That gave me a great range with only 2 lenses. I have rented the 100-400L lens a number of times and it is a thing of beauty. But it’s heavy. And I know I just said I was trying to limit the weight, but the versatile focal length of that lens meant that ultimately my bag was lighter with fewer lenses in it. The only problem was that I wondered whether I would be able to hold that lens up for 6 days of shooting. I rented it once for a day at the zoo and my arms where like wet noodles by the end of the day! So at the last minute I decided to pick up a monopod. Best decision ever!!! I don’t know what I would have done without it. Also at the last minute I decided to throw in my tiny little 50mm f/1.8 lens, which turned out to be a lifesaver. Why? Because my 24-105L ended up having a broken weather seal and it fogged up inside!!!!! The worst time ever to loose a lens. So here I was on this super expensive trip, with photographers that had WAAAAAY better equipment than me (that always happens), and I’m shooting with a $100 lens!! Haha. Overall, the trip was outstanding. The ship was gorgeous, my cabin was small but comfortable, the food was excellent, and the bear guide and skipper was knowledgable, experienced, and alot of fun too. The bears were obviously A-MAZING!!! I met some really nice people and some that were … well … you know. I have found that on these kinds of trips there is always someone with an ego that is too big for the room – or the ship in this case. Hence my desire for alone time on deck! The only negative I found was that shooting out of the zodiac was very uncomfortable. It’s one of those zodiacs where you sit along the edge. So when you come up to a bear, half the people are on the bear side and half the people are on the other side. 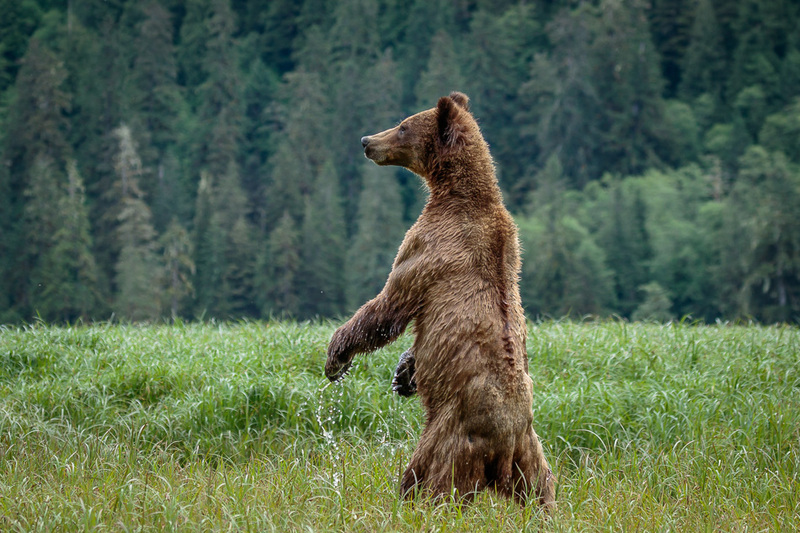 In order for everyone to shoot, the people on the bear side have to go low by kneeling or squating, or you can sit on the edge and twist around. Being on the bear side is awesome because you can get a low angle with water in the foreground. But for someone like me who cannot kneel, it is extremely challenging. When you are on the other side of the boat, you get to stand. Knee pads make no difference, I cannot do the kneeling position even if I kneel on the couch! So that meant long periods of uncomfortable squatting. The trip was probably the straw that broke the camel’s back (or knees in this case) because after I got home my knee problems got significantly worse resulting in my not being able to walk for more than 5 minutes for a whole month. Now it is 3 months later, and I still am unable to walk more than about 20 minutes and that’s with my knees taped and tons of physical therapy behind me. It’s a problem with my kneecaps not tracking properly resulting in the underside of my kneecap rubbing on the thigh bone. It’s not pleasant. But this is a situation that has taken years to develop and is ultimately caused by a muscle imbalance due to my old back injury. So the bear trip didn’t cause the problem, but exacerbated an existing knee problem. I would caution anyone who has knee problems about this kind of shooting arrangement. Because there are only a few outfitters that are permitted in the park, there are not a lot of options. I believe that they all shoot out of similar types of zodiacs. As a final note, I’ll tell you something you probably wont believe. I made all of the photos in this post on the first day. Yes, you read that right. After this remarkable day, I had 5 more and each day was different. Those photos will be coming up soon on the blog. More grizzly bear photos in Part 2. Thank you so much Sage! Your images and stories are a great inspiration to me. Love your absolute free spirit and intuitive guidance! Thank you so much Christopher! It’s always a good feeling to know that my work can inspire others, so thank you for saying that. 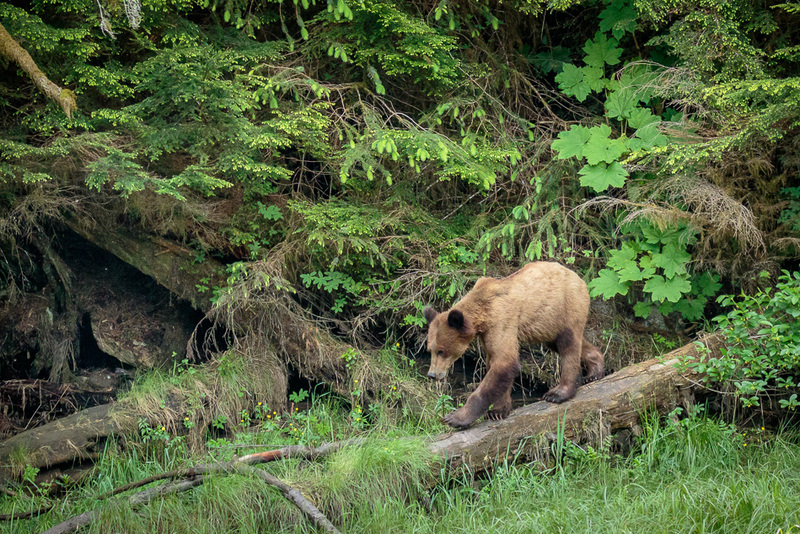 Your AMAZING bear photos convey how very special your first day’s experience was for you. I can’t wait to see the rest of the photos. I too purchased the Canon 7D mark II to replace by old and beloved Canon 7D. 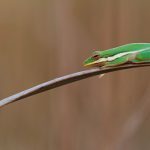 Your wildlife settings recommendations will be greatly appreciated as I love to photograph the wildlife here in South Florida. Hi Danelle, I hope the wildlife in South Florida survived Irma. I was thinking about some of my favourite spots down there like Ding Darling. I hope somehow the birds could feel it coming and flew away in time! Thanks for your comments on my bears, it was truly an exceptional experience. Oh boy, can I say bucket list. Wonderful photos, as always, thanks for the post. Hi Vaughn, yes, bucket list!! It was on mine for a long time and now that I’ve done it, its going right back on my bucket list 🙂 Thanks for your comments. What beautiful shots and I for one never can get enough pictures of Bears! Your trip sounds like a once in a life time adventure. Thanks for sharing! 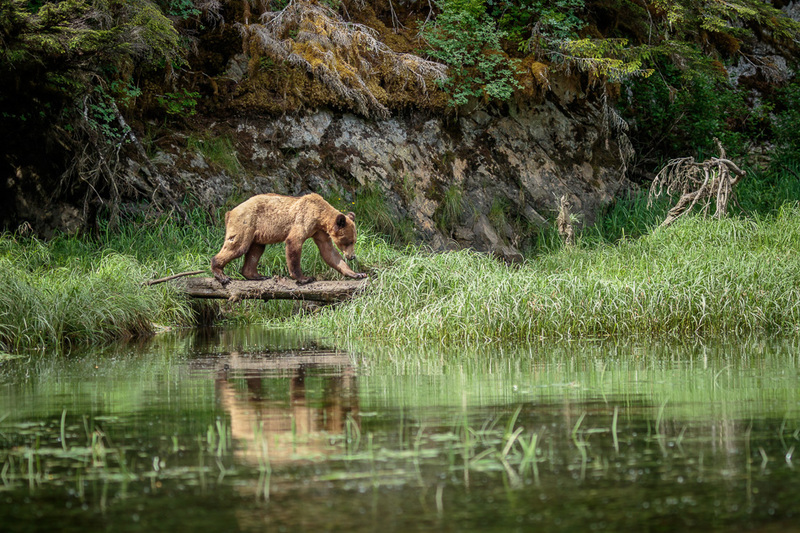 Superb images and some of the clearest I’ve seen of bears in the wild. Looks like you were just the right distance and the zodiac kept fairly still (or you had a fast shutter speed?). Sorry to hear about your knee problem but i have a similar one now in the 2 lower back surgeries (one emergency) has left nerve damage in both legs and my outer thighs & groin pain is pretty much continuous and the muscles weak so can’t kneel or squat). 20 months of thigh exercises made no diff. So I have to stand upright mostly or walk around. Can’t stand still for too long. But I don’t have the health or finances to travel so I make do with local walks, taking random shots along the way of anything I see. I have great admiration for wildlife photographers who have the patience to sit waiting for that perfect moment to press the shutter button. Hi Vicki, yes the zodiac was usually moving extremely slowly AND I was using a fast shutter speed of at least 1/1,000 second. I do love my wildlife photography, but it is hard on the body because you often have to be in awkward positions for long periods of time. Thanks for your visit and comments! Awesome!! And you had good weather, clear skies. Yes, Paul is an incredible photographer. The weather was pretty good, although we did have some rain as well. But not so much that it kept me from shooting! 🙂 I like that – bear whisperess, haha. Thanks for your comments Kaz. Wonderful pictures yet again Anne – you’ve even captured the hairs on the back of the bear . So sorry that you had to suffer (and still suffer) so much pain to get them. I’m sure that those of us who follow your Blogs don’t want you to suffer so much – we appreciate you so much. Pat, thank you so much for your kind comment. Hopefully the knees will recover soon and with regular exercises I wont have this problem again. Although I understand I have to do the exercises forever or it will come back. Photography can certainly be hard on the body – especially with the heavy gear. Spectacular Photos, I’m jealous. Being an aging and aching outdoor photographer, I like all your personal feedback, your equipment plans and failures, your impeding health issues and your ability to persevere regardless. Many thanks Clarence, I appreciate that. I figure I can’t be the only one that has these physical problems so hopefully my experience can help inform other people that are planning similar trips. Thanks for your visit and comments. Oh, wow, what an adventure, opportunity, and story, with absolutely stunning photos! I can’t wait to see more. It’s wonderful that there’s a sanctuary for grizzlies where they can go about their lives essentially untouched by humans. I’m sorry you paid a physical price with exacerbated knee problems and hope you’ll soon recover. but again, oh, wow, the photos you captured in spite of the pain. 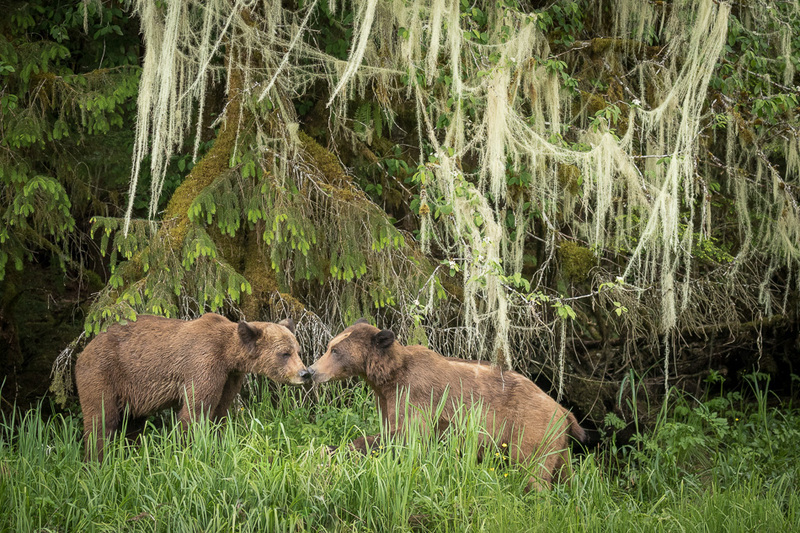 Hi Suzy, it is wonderful that the grizzlies have such an incredible habitat that allows them to thrive. And BC just put a ban on all trophy hunting in the province, which is a step in the right direction. Thanks for your comments. Excellent images hopefully well worth the knee pain. 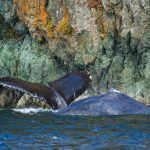 I’d be thrilled with the experience but then to have these images is the icing on the cake – fantastic! Hi Ingrid, that’s exactly right. The experience is the most important thing and the photos are an additional reward 🙂 On the other hand though, the fact that I’m making photographs causes me to watch more carefully and learn the animal’s behaviour so I can anticipate that magical moment. What an amazing experience to have. I’m so impressed with your work and even more impressed with the results despite equipment challenges. Love your work and look forward to seeing more. Thank you so much Paula, I appreciate that 🙂 It was truly an incredible experience and I hope to get the chance to do it again! You made me fall in love with those bears. Thank you! Anne, these are absolutely exquisite images! Among the best grizzly photos I’ve ever seen. And I love the post, too. As a fellow introvert, I can really relate to your need for alone time on the deck! Congratulations on the photos and I look forward to the next installment – and to the stories of how you used the specific gear you took (including the 50mm lens – I have one of these low-cost gems, too, and it’s great to hear it proved indispensable). Hi Laurie! Thank you so much for your kind words. 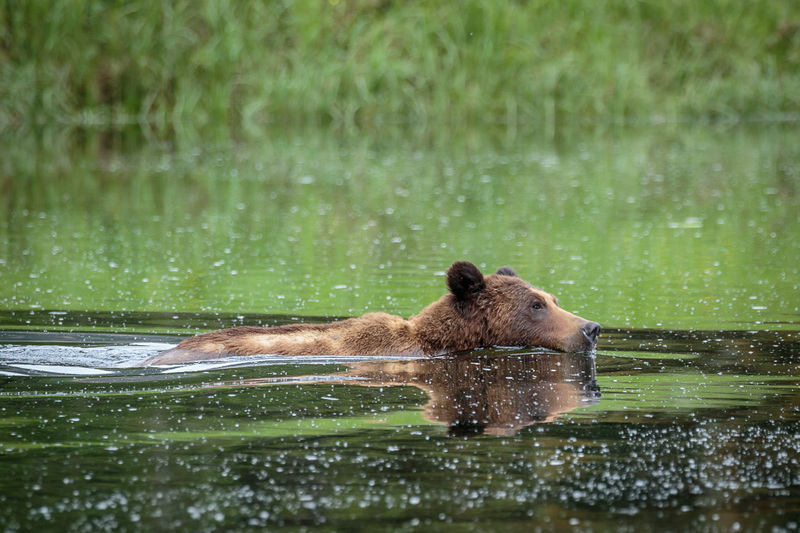 There are a lot of great bear photos out there, so to be among the best really means a lot. Yeah, I was so glad I had that little lens!! It was definitely worth the $100 or so it cost. I also had it with me on the boat one day while my other lens was being fixed and it was a day the dolphins came to visit so I really needed the short focal length. That lens is sharp! Thanks for your comments. Ann, Congratulations, beautiful pictures and so sharp!!. 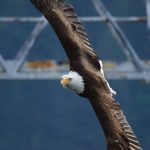 How did you manage to take such sharp photos sitting (or kneeling) on a zodiac? Fantastic work!! Hi Ricardo, the sharp photos are because of a fast shutter speed to freeze the motion of both the bears and the moving boat. I used at least 1/1,000 second for all of these shots. Thanks for your visit and comments. What a fantastic opportunity to be one of the lucky 200 during 2017 to view the Grizzlies. 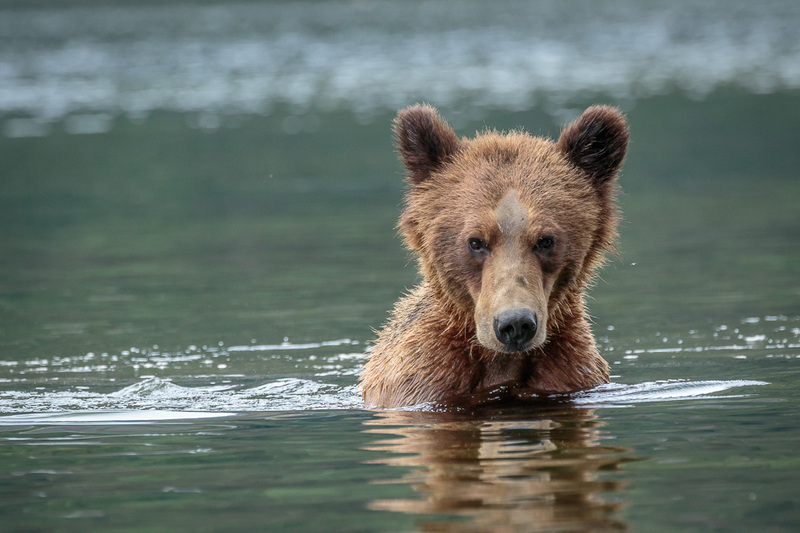 The photos documenting the life of a bear is just amazing. I look forward to seeing the rest of them. Much appreciated Linda! It was an incredible opportunity and I was really glad I looked into the trip so early because they book up fast. Beautiful pictures! And no, we won’t get tired of bear pictures. I’m not getting your emails anymore; I’ll sign up again. Thank you very much Kathy! I hope you got signed up for the newsletter again. I’m always sending out my new tutorials. 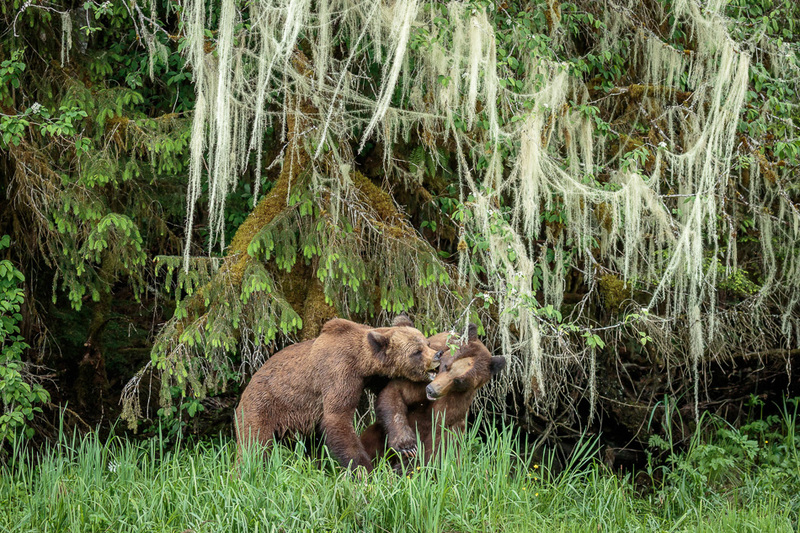 Thanks Anne for your great photo gallery, each shot is exceptional and it was great to see the “Bears” through your lens. A trip of a life time and these memories are timeless. Hi Dale, if only my body was as flexible as my resolve! haha. Glad to hear you enjoyed the photos. I still have tons to go through and then all my Scotland images too. Fortunately I’m starting to get faster at processing! Thanks for your comments. Hello Anne. I did the same camera route as you – the 7D and then the Mark 2 model, but I haven’t got any photos as great as your bears! Very nice. I got to your site via the love your rv site, which i found out about from Doug at Drainmaster. I’ve done a couple videos for him. We are from southern Ontario but have a daughter in Nanaimo. We are in the very long process of getting rid of stuff in order to sell out and downsize, which may include going full time in the RV for a while. Perhaps we’ll run into you folk in a campground somewhere one day! Hi Dave! Always great to make contact with fellow photographers and RVers! We love Doug and Midge so it’s wonderful to meet your acquaintance 🙂 Sorry to take so long to reply, I was away in Scotland for 3 weeks so I got behind on my comments and emails. Good for you for downsizing. It feels great to get rid of all the stuff and become free. Yes, maybe our paths will cross one day and we can go on a photo shoot together. Thanks for your visit and comments. 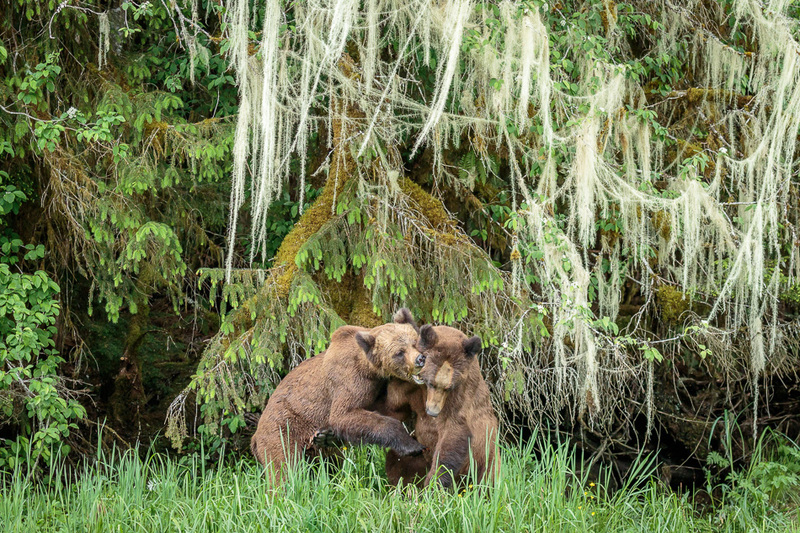 Anne, your photos are always special, but these latest pictures of the grizzlies are something else! I’m so glad that this place exists for the bears! Congratulations on being brave enough to go to Scotland alone, it’s so inspiring, and the photos are spectacular! Hopefully your knee problems can be fixed, medically. your creativity is very special. Thank you very much Sharon! I really loved the grizzly trip. So much so that I’m thinking about doing another one next year! My knees are coming along – it will just take physiotherapy to correct the problem. I’ll probably have to do the exercises forever, but that’s okay. I already have a set I do for my back anyway. Thanks for your very kind comments, I appreciate it! Love this stuff. I’m a lifelong nature photo buff myself. I loved your bear photos and stories. So glad I found you. Thank you very much Stephen! I love the bear photos too 🙂 I just wrote Part 2 and was just reviewing these photos again and I have a big smile on my face. I think it was my favourite trip ever. Wow, Anne!!! I love all your Grizzly pics! They are colourful and sharp. I really like the ones with the two bears below the moss hanging off of the trees. You captured them beautifully. I don’t recall seeing this sanctuary’s name when I Googled BC Grizzly packages. I will have to research some more. 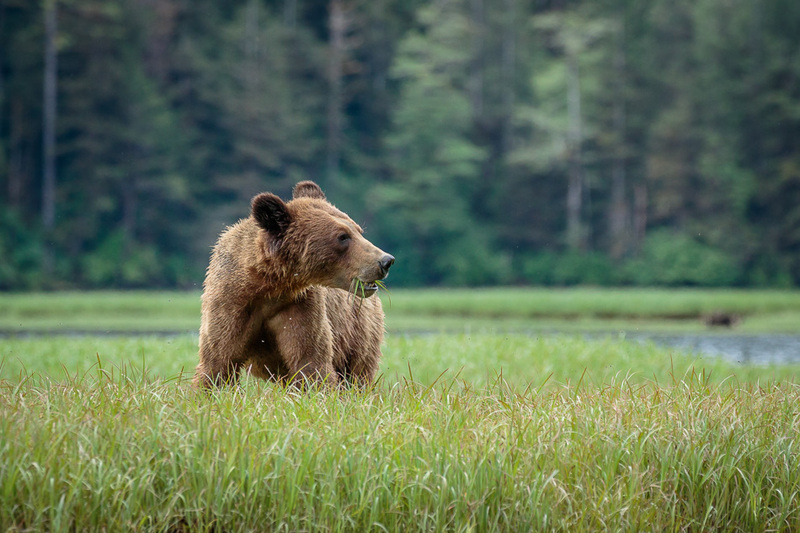 Photographing Grizzly’s somewhere in BC is on my list. First will be Tofino though; it will be more financially feasible for me (and I can drive there). Maybe I will see the ocean Wolves. Thanks for the lovely photos and story. 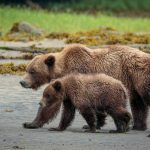 Hi Jane, photographing the grizzlies is an amazing experience. It’s hard to get a spot though because of the limited number of people they take in there, so you have to book way in advance. Tofino is lovely, you’ll enjoy it. I also like Uclulet on the west side of the island. 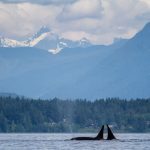 It’s worth a visit if you are going over to Tofino. Thanks for your visit and comments! Amazing photos! Seeing the grizzlies up close makes me want to wish I was there! Thanks so much for sharing! It was a pretty amazing experience all right. Thanks for your visit and comments Jake.